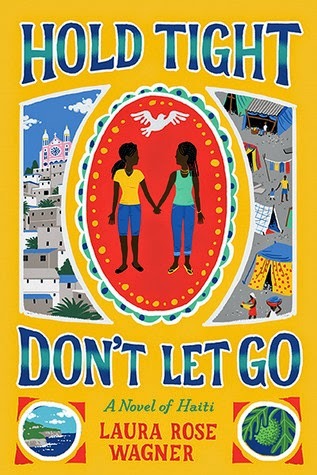 Hold Tight, Don't Let Go: A Novel of Haiti by Laura Rose Wagner. Grades 9+. Abrams, January 2015. 264 pages. Review copy provided by my local library. Cousins Magdalie and Nadine are inseparable best friends. Ever since Magda's mother died when she was little, Nadine's mother has been manman to both girls, raising them as sisters. But when an earthquake strikes Haiti, Manman dies and the house in which the family lived is destroyed. With no resources, the fifteen-year-old girls move to a ramshackle camp where they live with an uncle. The camp is horrifying, but as long as she has her cousin by her side, Magda knows she can survive anything. When Nadine's father in Miami sends for her, Magda is left alone for the first time in her life, and although Nadine promises to get her cousin a visa and bring her to America, Magda soon realizes that this may be an impossible dream. This is a vivid portrayal of Haiti after the earthquake. Magda's life has changed in an instant. Suddenly, she has no real home. She doesn't have money for school fees, she sometimes doesn't have money for food. This survival story is an account of Magda's day-to-day life after the disaster and her journey to gain power over her own destiny. Several times bystanders and folks on the street remark "Look at this country" as if they still can't believe the situations they're seeing in their own country. People are devastatingly aware of a need for change, but just as devastatingly powerless to create change. This is also a portrait of a country and a people picking up the pieces after a terrible disaster. At one point Nadine remarks that in America people thought she was crazy for running out of a store when she thought she felt the ground shake, even though Miami is not on a fault line. She says people in Haiti would have understood, it would have been normal. But although this is a story set in an impoverished country, Laura Rose Wagner has also created a love letter to Haiti here. This book is a sensory experience - the sounds of the language and the tastes of the foods drawing the reader in. Magda returns to her birth village in the southern mountains of Haiti to bury her Manman, showing the reader the seemingly paradisiacal farm where Magda's relatives live. And just as Wagner paints a picture of Haiti, she paints Magda's emotions. This is, above all, a story of Magda's emotional journey from denial of her situation to acceptance and the ability to move forward and create a new plan for herself. For more on Haiti and Haitian women, definitely check out everything by Edwidge Danticat. Her books are published for adults, but I started reading them in high school and I think they have crossover appeal. Lost Girl Found by Laura M. DeLuca and Leah Bassoff is another story about a strong teenage girl surviving after a devastating event costs her her home. In this case, it's soldiers destroying her Sudanese village. For teens who are more into the close female friendship between Magda and Nadine, I kept thinking about Sister of My Heart by Chitra Banerjee Divakaruni while I was reading. That's another book that's published for adults, but I think has high school crossover appeal.